I'm a bass angler. I don't know what it is about those little green and brown fish, but they've got me hooked. Chasing them around lakes in the Midwest is what I love to do, but as someone once said, "there are many fish in the sea." Every year I get to travel with my in-laws up to Colorado. This new tradition started for me back in 2012. As many of you know, a bass wouldn't do very well up in the Rockies. Trout however flourish, so I decided I would chase those while on vacation. I did my research before traveling up there my first time in hopes of tangling with some browns and rainbows. If I remember correctly, I got skunked my first day of fishing. I was doing everything I had read to do, but I had no confidence doing it. I changed my game-plan for day two: I would fish for bass, only, I was fishing for trout. On day two I tackled the same stream I'd been fishing up in Estes park, only this time, I had the “Ned Rig” tied on. My search for trout began by casting to current breaks, fishing my lure like I do a shaky head. 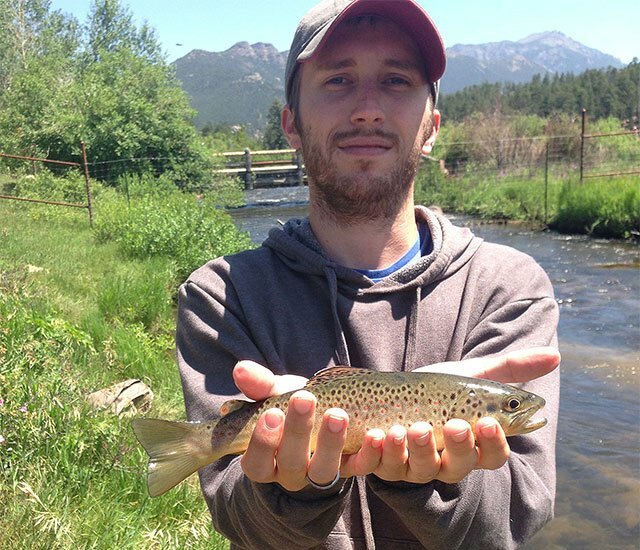 It wasn't long until I caught my first Colorado trout, and then another, and another. Before the day ended I had caught over ten. The moral of the story here is to fish your strengths. I know there are better ways to catch trout than the way I did. However, I was able to catch some by doing what I know how to do. Perhaps someday I will pick up a fly rod and learn the art of catching them the right way. Until then, I'm content with catching them the same way I catch bass at home.